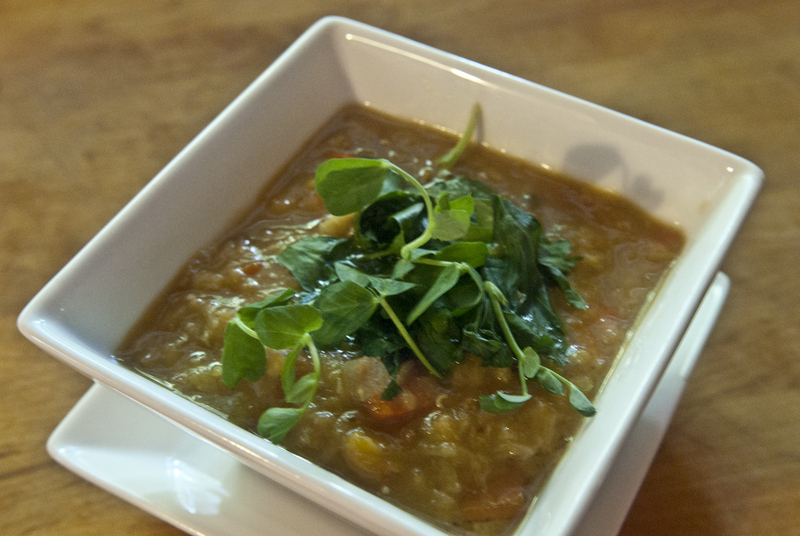 Bodacious Grains of Paradise, Chicken & Lentil Soup – BODACIOUS GRUB! I felt like cooking soup today and had some grains of paradise that I had purchased at Boulette’s Larder at the Ferry Market in San Francisco. 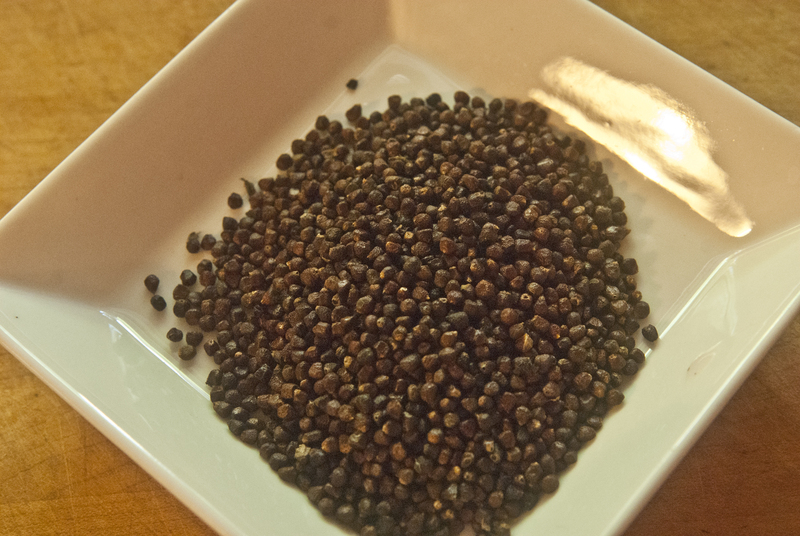 Grains of paradise are peppery seeds from the Aframomum melegueta plant. They have been used in their native West Africa for centuries, and in Europe since at least the 800s. Today, they are commonly in used in Northern Africa. Stores which specialize in spices may carry grains of paradise. They can also be ordered through companies which import spices. This spice is also known as alligator pepper, Guinea grains, or melegueta pepper. It has a slightly peppery flavor, but the taste of grains of paradise is a bit more complex than pepper. The spice tastes a bit like coriander, ginger, and cardamom, with a bit of a citrus flavor. It is milder than black pepper, but it still packs a punch, especially when applied in large amounts. I had a few ingredients that I wanted to use up along with some home made veggie stock. I had not one onion in the house (I turned the veggie drawers over and could not find one) so I used leeks instead and that was a success as leeks are wonderfully sweet and complex. I also had some lovely small garnet yams in the fridge and added those as well for more sweetness. 1. Heat the olive oil in large pot and add the leeks and saute until softened, about 8 minutes. 2. Add the carrot and sweat until the carrots are softened, about 7 minutes. 3. Add the chicken breast and continue to saute until the chicken is slightly browned. 4. Add the remaining incredients and stir to combine. Increase the heat to high and bring to a boil. 5. Reduce heat to low, cover, and simmer until the lentils are tender, about 40-50 minutes. Check from time to time and add additional stock (or water) if the soup is too thick. I topped mine with a bit of parsley and some delicious pea shoots for some additional pepperiness. 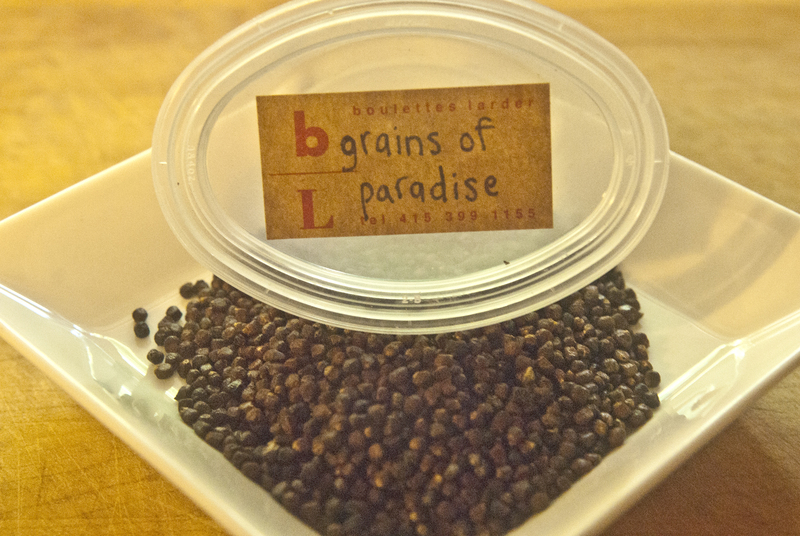 Be warned if you munch on a grain of paradise you will get a good hit of peppery flavor. But a lovely pepper it is. Enjoy, serve with a side salad for a healthy meal.